The unique water-resistant formula includes sunscreen for protection against both types of harmful rays. 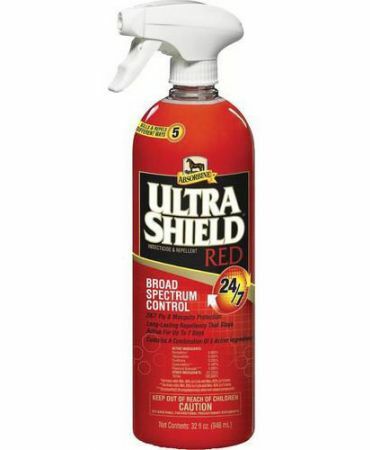 ULTRASHIELDEX CONTINUOUS FLY SPRAY 15 OZ. Absorbine UltraShield EX Continuous Spray provides the effective UltraShield EX fly control formula in a continuous spray bottle. Sweat resistant, weatherproof formula kills and repels biting flies, insects, mosquitoes, gnats and ticks for up to 17 days. Quiet, continuous spray bottle allows you quick and even coverage, even upside down. The Absorbine UltraShield EX Continuous Spray bottle is conveniently sized for shows and travel. Endure Sweat-Resistant Fly Spray contains 0.20% Pyrethrin that provides up to 14 days of fly control, as well as RepeLock, a special conditioner that binds to the hair and won't sweat off. ESPREE FLY SPRAY CONCENTRATE QT. FARNAM BITE FREE FLY SPRAY QT. Bite Free Biting Fly Repellent provides horses fly control for up to 14 days.